Allow us a to paint a picture for you. With a deep bow of reverence to legendary Japanese painter Katsushika Hokusai, we want to make a real wave about Kanagawa, the board game. You don’t have to visit Japan (even though we recommend you do!) to recognize that its culture has produced a lot of things which unite clear, simple lines and enchanting beauty. And it is not only in the Geisha tradition that in Japanese culture, learning can be a lifelong undertaking shaping both craft and spirit. Kanagawa follows in its footsteps, but fortunately it is also a game that commands much less patience and time, yet still produces fantastic results and is beautiful to look at. But let’s start at the beginning. In Kanagawa, all players are disciples of Master Hokusai, trying to learn in his studio of art how to produce visual effects on canvas, capturing the mood of the different seasons as well as specific objects like trees, buildings, characters and animals. And while his wisdom is available to everyone, not every disciple can take away the same learning from the Master. The core mechanism of the game is that each round, players go to school and take out between one and three lesson cards from their school day, which they need to add to their studio or print. Before entering into the flow of the game itself, here are five elements in Kanagawa we need to introduce in isolation. If you don’t care about the rules, feel free to skip down to the bottom part of game flow and scoring. The school itself. The school mat has three rows and four columns (player number dictates whether two, three or four columns are used). A school day works like this: First, lesson cards are placed across the first row. Cards are generally face up, but on red slots the card is placed face down. 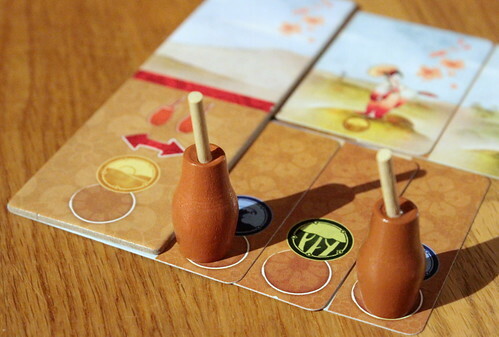 Once a row is laid out, beginning with the start player each disciple decides if they want to stay in school (i.e. wait for further cards) or leave school to practice. A player deciding to leave school immediately chooses one column, takes all its cards and places these in their tableau. That player no longer takes part in this school day. Then the next lesson starts, and lesson cards are placed across the next row (columns from which the above cards were already taken are ignored). Again, from the start player on, the disciples decide if they want to remain in school or take all cards from one column. After the third round or if at the beginning of any second round exactly one player remains in school, everyone has to take all lesson cards from one column and go practice their abilities. Lesson cards: These cards are plentiful (72 in all) and come with four back sides depicting the main subjects (trees, buildings, characters and animals). Each lesson card has two distinct parts (one printed the wrong way up from the other), indicating the two distinct things disciples can take from a lesson: The studio part – which adds abilities and resources to the pupil’s studio. And the print part – which means the pupil adds a part to their painting, exercising their learned abilities. Players start with a random start tile, which features their god-given talent in the studio part (i.e. one painting skill), as well as a start for their paintings in the print part. When picking up the cards, the disciples have to decide if they want to add the card to their studio or their print, and only that part then becomes active – the other part is covered up. The studio element depicts the abilities and resources the pupil takes from the lesson, and retains until the end of the game. This can be one of the four basic abilities to paint landscapes (forest, mountain, plains and oceans), as well as extra resources or know-how (brushes, movements, the assistant pawn – more on that later). Disciples can always add a lesson card to their studio without precondition, and will thus retain the depicted ability for the rest of the game. The main subject will always correspond with the reverse side of the card – in that a ‘animal’ will never feature buildings, trees or characters. However there are ‘empty’ cards, so without a main theme on them. The season will always be one of the four standard seasons – or a storm cloud, which in scoring counts as a seasonal wild card. Finally, the main subject (if present) is depicted in front of a landscape, the symbol of which (forest, mountain, plains and oceans) is shown at the bottom of the card. This is key, as the disciples can only add cards to their print if they can paint that landscape; meaning: it’s a landscape type they have learned to paint by adding the icon to their studio. 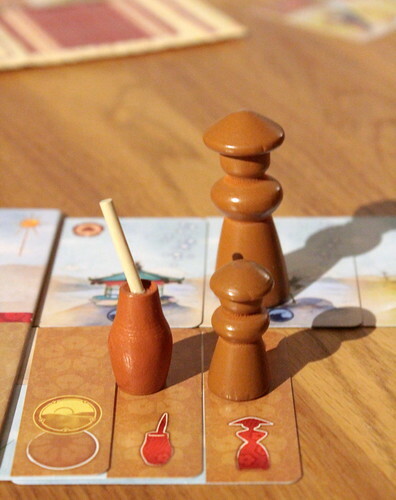 Next, Brush meople (brush-eople): Players start with two brush-eople in their supply, but can add further ones during the game in different ways. Brushes are important to paint, of course, and in Kanagawa, even more than usual. By adding cards to their studio, players will look to add the ability to paint more landscapes. A landscapes can, however, only be painted when the disciple has placed a brush-eople on that icon. Initially that is easy because you start with two brushes and one landscape, but soon you will have likely more landscapes than brushes. And while players are allowed to move one brush-eople within their studio per round (more move permissions can be added to the studio as extra abilities), this really limits what you can paint and when. Diploma tiles come in sets of two or three diplomas. Without going into detail, disciples can earn a diploma for adding cards to their print depicting different animals (one set), different or identical people (another set), 3-5 trees (a third set), or getting 3 / 4 brush-eople etc. Diplomas are worth points (between 1 and 9) at the end of the game, so it is good to get them. Three issues however: You can only get one diploma from each type and, complicating matters, once you have taken one of a colour, you are locked onto that and cannot upgrade. Equally tricky: You can only take the diploma the moment you fulfil (or exceed) the diploma’s requirement. An example: There are diplomas for painting 2, 3 and 4 different buildings. A disciple paints two buildings early, so decides to wait and get a better-scoring diploma, because if he/she takes the 2 different buildings tile now, he cannot score one of the higher ones. Now another player overtakes him, gets three in succession and claims the 3 different buildings tile. Our poor disciple can now NOT take the #2 diploma just like that, that ship has sailed. He/she would need two more buildings to make it to the #4 – or end up empty-handed in that category. So it is often a gamble, especially early in the game. Grand master and assistant pawns. The grand master is already an old man, so he doesn’t move around much. The grand master pawn indicates the current start player, and only changes possession between school days. The assistant is more jumpy, so the smaller assistant pawn often changes affiliation several times during a round. Assistant icons are frequent on the studio parts of lesson cards, but also appear on diplomas. Whenever a player adds a card to their studio or gains such a diploma, they immediately take the assistant pawn, the player who holds it at the end of the round gets the grand master and is the new start player. Which brings us back to the grand scheme of things. Each school day, the disciples gain cards from school which they add either to their print or studio, working on their piece of art or acquiring proficiency and abilities. There should be a balance between adding cards to either row on your tableau – you need to add abilities early to paint the things which will allow you to score highly, on the other hand you can’t ignore painting for very long or you will run out of time (and diplomas). The game ends once one player has eleven cards in their print – or if the card stack runs out (which realistically only happens in four-player game). 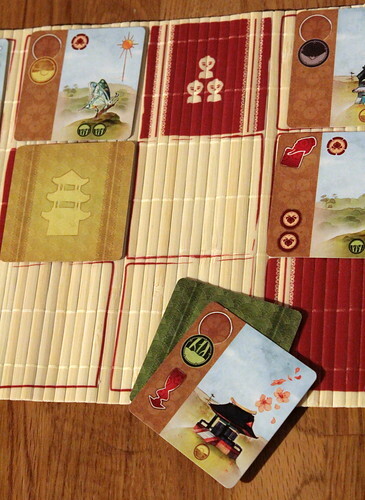 Then, points are scored as follows: Each card in a player’s print score one point. So does each victory point visible in the studio or print. Each diploma grants its point score, and the player who ends up with the grand master gets two extra points. Straightforward. Now for the seasons: You score one point for each card in your longest coherent season, so consecutive cards in your print depicting the same season. And you might remember there are four standard seasons on the lesson cards plus storm clouds instead of the season, as well as three storm markers associated with diplomas. 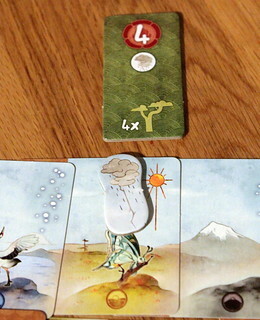 Storm clouds are jokers and can represent any season, and the markers granted by the diplomas can be placed at the end of the game to extend (or ideally: connect) patterns of one season in your print, which can quickly become the difference in a game that was routinely very close for us. First off, Kanagawa is beautiful. Beau-Ti-Ful! 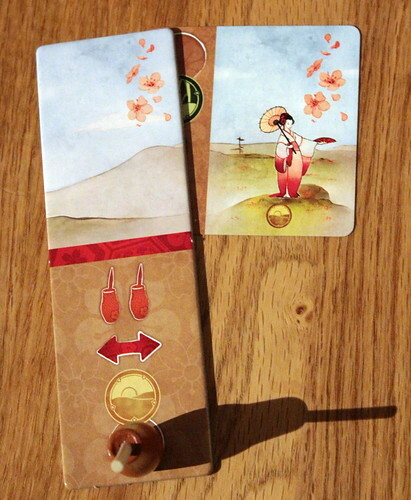 The print part of the cards (illustrated by Jade Mosch) is amazing in its Japanese style, the wooden bits (including the brush-eople) are a real treat and quite unique. Another very original detail is the school board made of straw, which comes rolled-up and very much reminds you of traditional Sushi mats – a great touch. Overall, the materials and artwork of Kanagawa are second to none and by themselves make it a game worth having and looking at. There is barely any downtime, even if you leave school early in one round you will not be idle for more than two or three minutes. Overall a thoroughly convincing and enjoyable game with an extremely high replay value! Zavandor, the land of gem mining. After Mines of Zavandor, Gnomes of Zavandor is the second mining-themed set title in the fantasy world. Unlike its predecessor, Gnomes of Zavandor has a strictly economical engineat its core. Village is a medieval countryside life simulator. Only it cuts away the boring 99% of it and lets you make the decisions that shape your fameeply’s lives. Should the new kid learn a craft? Go into politics? Maybe go and see the world. Everything is possible, and everything might earn you a spot in the village chronice – or in an unmarked grave.